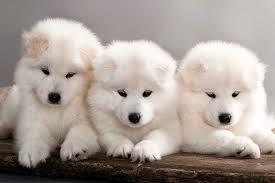 This beautiful looking breed, is one of the ancient breeds and was called after the Samoyedic people from Siberial. It is part of the spitz group, and has a very thick, white double layer coat. 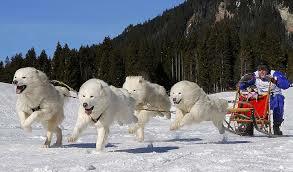 They were bred to help with herding of reindeer and also pull sleds and hunting. It was bred from the Nenets herding Laika, which comes not only in white, but also a variety of colours, however, breeding resulted that this dog always has a white coat. It is thought that it was first brought to the UK in late 19th centuary and un the USA about 1905 where it was recognized by the AKC the same year. Apart from being a beautiful looking dog, this breed has a temperament to match, being very friendly to all it meets. It has actually earned the nicknames 'Sammie Smile' and 'Smiley Dog' from the happy, smile like look on its face and is often known as the Sammie. These dogs can make excellent companions and can be very good watch dogs barking if anybody comes near their homes, however they are not guard dogs and once the visitor gets close enough to be greeted, a huge fuss will be made of the new 'friend'! This breed is know as being supreme escape artists so if left alone, must be secure in the home, or they will find a way to escape. They do not do well being left alone at all. They are not hard to train and must be trained as they can be very indepent. The best ways of training are the use of positive reinforcement methods and being so independent, it is important for the owner to be constantly consistent and show that they are in charge of the human/canine social structure. They do tend to bark a lot, and it is very high pitched. A good idea to do lots of early training with Bark & Shush to prevent excessive barking. What needs to be borne in mind, is that this dog can really battle in hot weather, so always ensure that walks take place in the early morning or late afternoon, when temperatures are more suited to the thick double coat. Also bear in mind that they are heavy shedders and with the coat being white, easy to see on a lot of surfaces. On average the Samoyed is friendly to other dogs, however you must make sure that your dog has been well socialized so that it will accept another dog into the home. On average this breed gets on with other dogs. However, dont just base this on the breeds natural personality, make sure you get your dog from a good breeder who will have done their best to ensure correct temperament, and also take the pup for puppy socialization and continue socialization to keep good social skills in place. On average they are good with other animals, but do have a very high prey drive and will chase strange cats, small animals if the opportunity occurs. This breed is known to get on well with children. However do make sure you purchase your pup from a good breeder that has bred with the temperament in mind as well. Early socialization with children and continued socialization is always good and make sure that the good social skills remain in place. Do keep them on lead while out walking as they are likely to chase anything that moves. Don't walk them in the heat under any circumstances - exercise should take place early morning and evening, when temperature is likely to be lower. Remember this breed came from frozen climates and is adapted to life there.